Courtney started going to the gym in 2012 and was surprised by the amount of negative body talk she heard. The posters on the walls, the weight loss challenges advertised, the fat jokes she overheard, and the sayings on people’s t-shirts all reinforced the idea that she both didn’t belong there, but also NEEDED to be there. So she set out to create something she had never seen before—a fitness space where fat people would be welcomed and loved. Now, she’s an AFAA-certified group exercise instructor and personal trainer specializing in fat positive fitness. Her philosophy is “Everything I have access to is to be shared.” Giving back and donating her time and equipment is a big part of how she makes fitness accessible. She works with the NH Department of Corrections and housing authorities in both NH and MA. 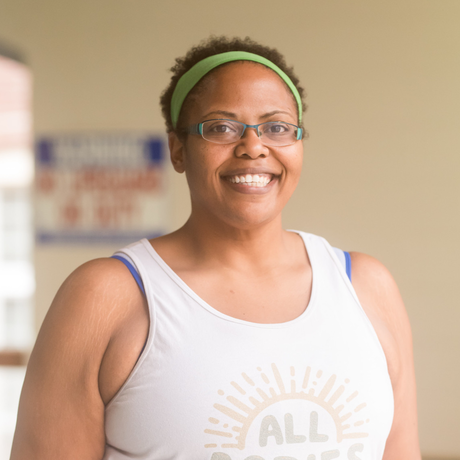 She sponsors gym memberships, continuing education, and equipment for folks who need it, and assists trainers and gyms to make their spaces more welcoming and inclusive. Courtney is an English teacher and dorm head at Phillips Exeter Academy. Previously, she taught as an English and Women’s Studies professor at UNH. She has a PhD in English from UCLA, specializing in Black women’s literature and prison studies. Courtney is also a member of the Body Positive Fitness Alliance, the Association for Size Diversity & Health, and the National Association to Advance Fat Acceptance. This event is free, but advance registration is required. Registration opens at 9am on the Monday before the event. Please sign up for our newsletter to be notified when registration is open. The event is held at The Music Hall LOFT. Doors open at 8:30. Coffee will be served 8:30-9am. Talk begins at 9am and event ends at 10am. There is abundant paid parking behind the Music Hall Loft and on surrounding side streets. CreativeMornings Portsmouth is a platform for individuals to share their own truths/stories as they define it. The viewpoints and opinions expressed by any individual do not represent or reflect larger viewpoints or opinions by the CreativeMornings organization or any local chapter and not should be taken as universal truths or professional advice of any kind.